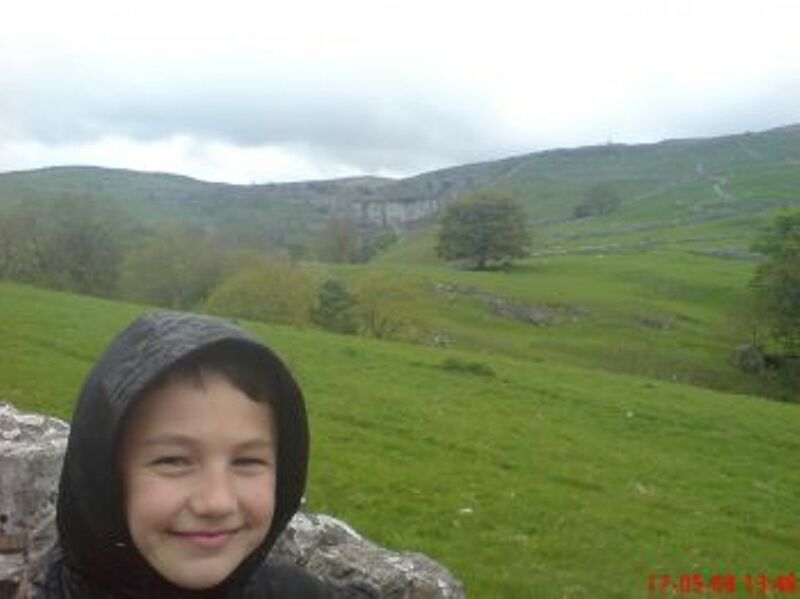 Some time ago we visited Malham with a nice walk to the cove, it inspired me to write a song about this superb lovely area, I performed it at the cove and can be viewed a little further down. 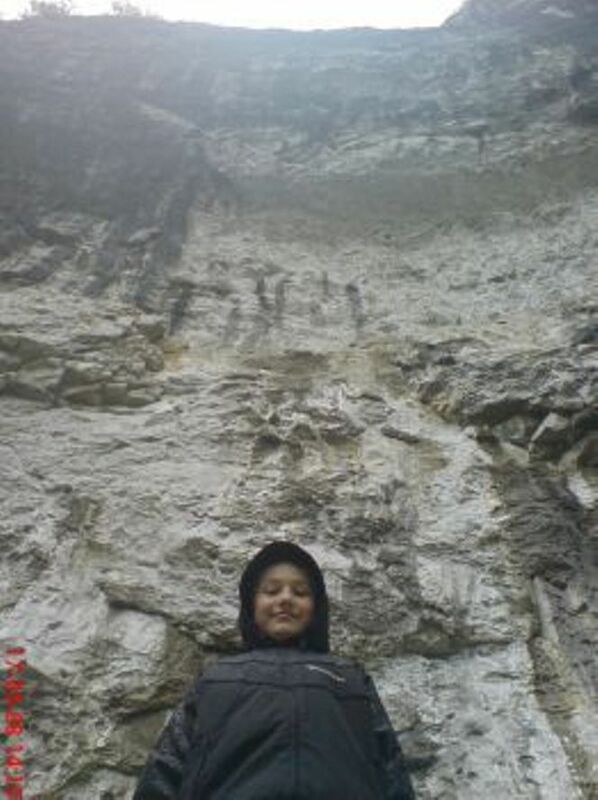 With a formation of natural limestone (calcium carbonate) Malham Cove is a beautiful place of Yorkshire, about one mile North of Malham village and about one and a half miles south of Britain’s highest lake Malham Tarn in theUnited Kingdom. 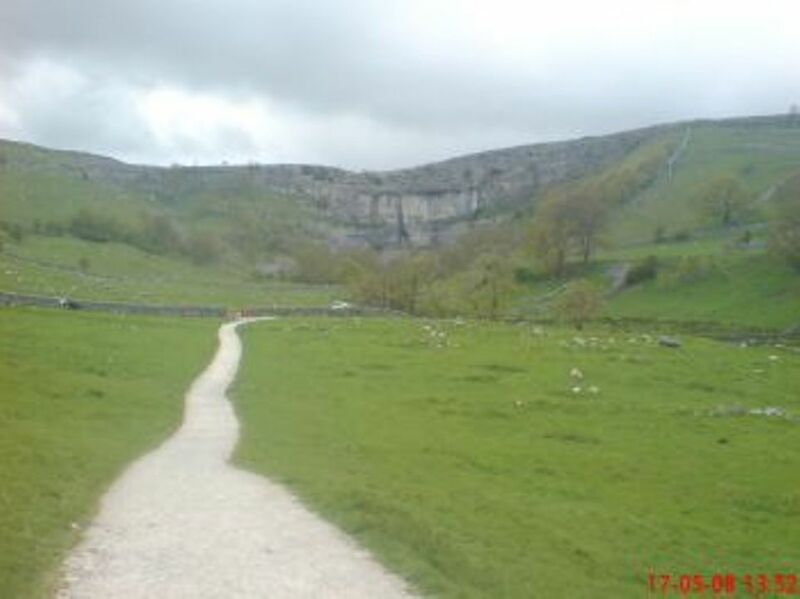 This head of the Aire Valley is a large curving cliff, on the West side a path of around 400 stone steps at irregular intervals lead up to the pavement of limestone at the top, the path is also part of the Pennine Way route. 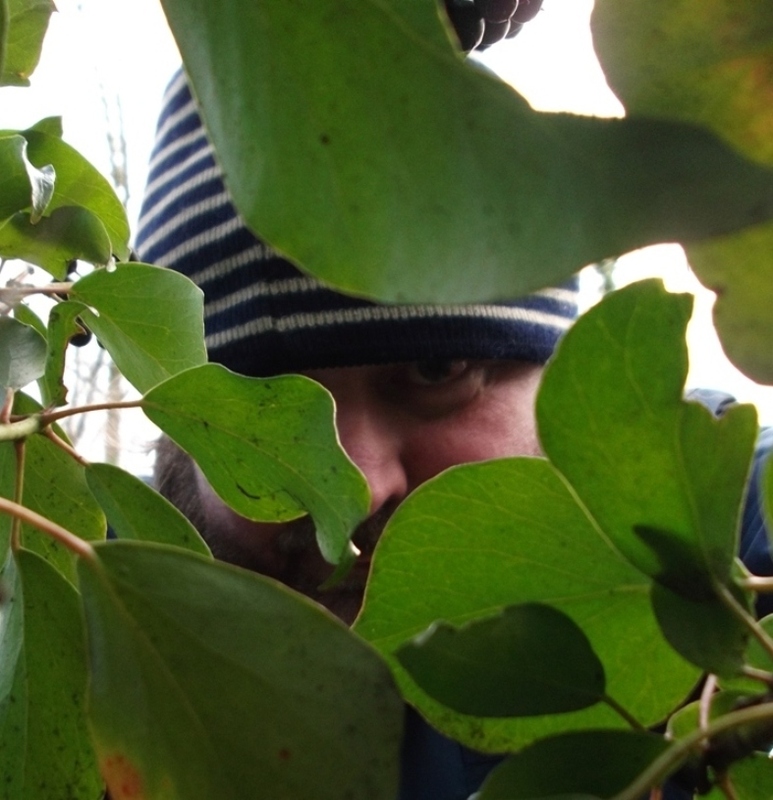 It is very popular with tourists and bird watchers (tweeters) alike. 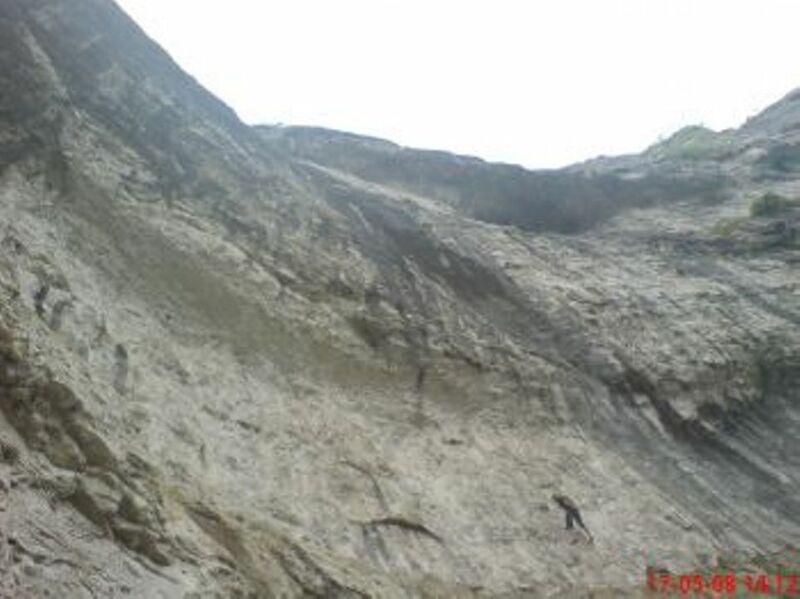 Climbers find the cove a joy of a challenge, mainly due to the overhangs which are – apparently – very difficult to judge, climbing attachments and hooks are left in place for all to use, seeing a climber challenge the overhanging lips are not for the faint hearted. 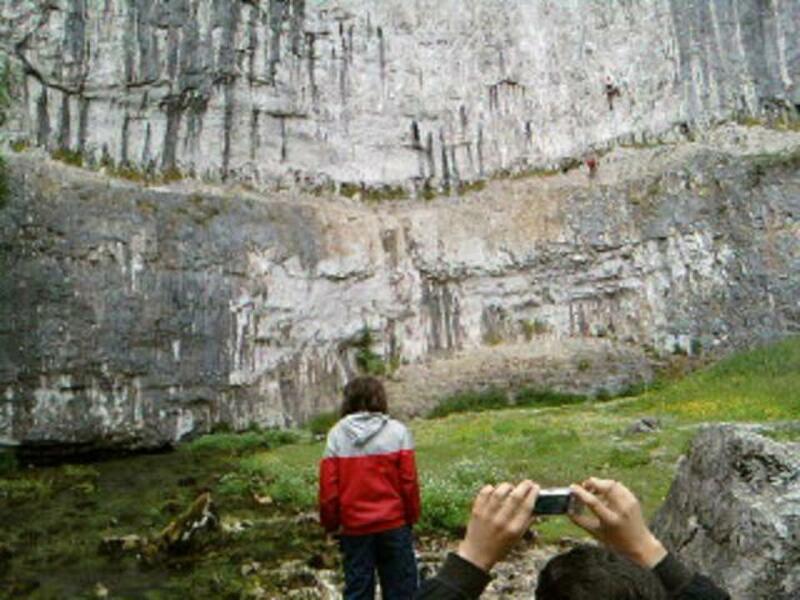 KARST is the given word for this superb created land of limestone. The rock gets dissolved by the rainwater leaving sinkhole marks, because soils struggle to form on limestone it leaves the landscape as we see it, gorgeous. A medium size car park is available at the village of Malham. It has a couple of pubs; The Buck Inn, and The Lister Arms. Two cafe’s; The Old Barn, and Beck Hall. A Tea Room; Town End Farm and a restaurant; The River House. 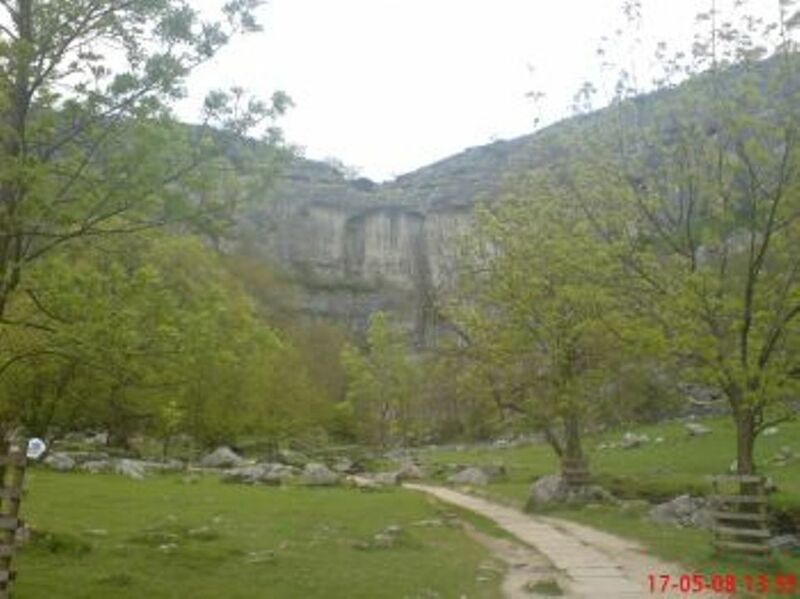 Campsites are also spread around Malham with various fields allowed for camping at specified times through the year. Glaciokarst landscape can be better to describe Malham. 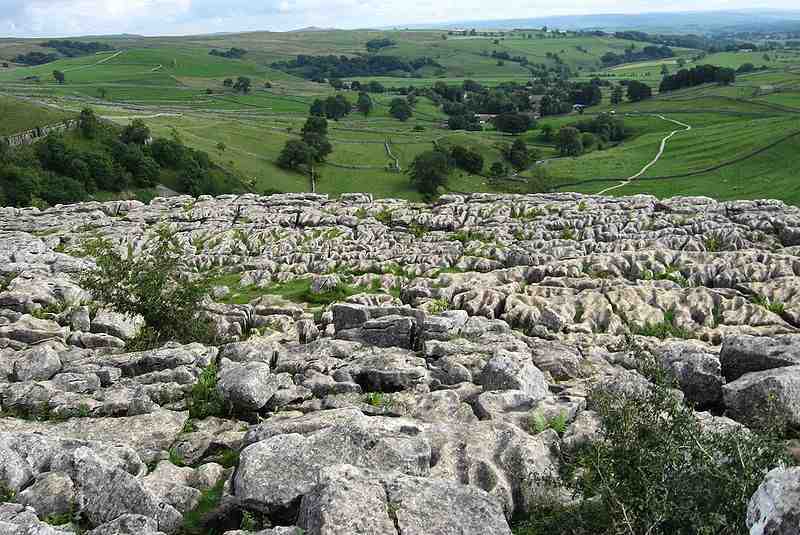 Once the ice had scoured away all the soil exposing the limestone pavement to the elements, rainwater seeped into the fractures showing one of the most distinctive features of the glaciations, the Limestone pavements. These fractures were opened them up by the dissolving the rock walls to produce the clints and grykes. 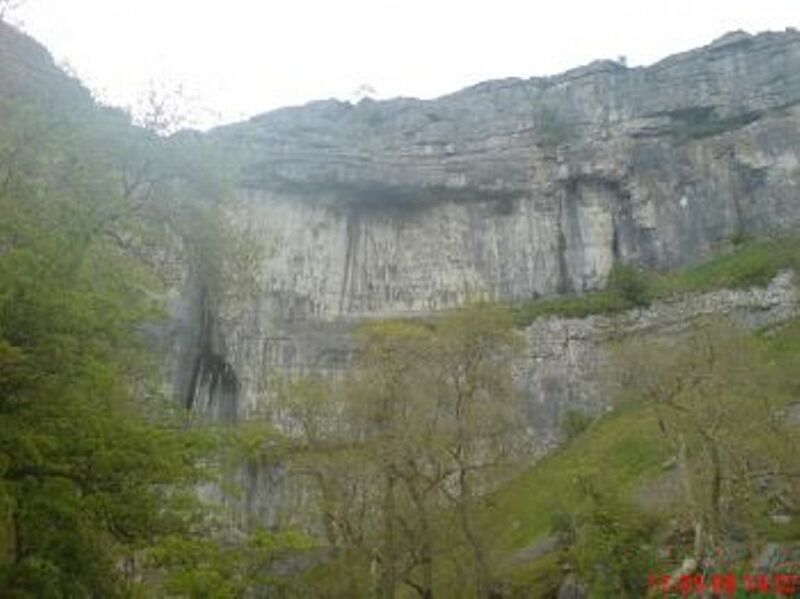 The curved shape is due to the erosion taking place on the lip – central areas – more than the sides, with a size of 260ft (80m) high and 1,000ft (300m) wide the waterfall would have been huge, an enormous amount of water would have flowed over Malham cove. In the early 19th century it was last recorded of any amount of water volume flowing over the falls, due to the systems of caves behind the cove any flood water usually disappears before reaching the fall. 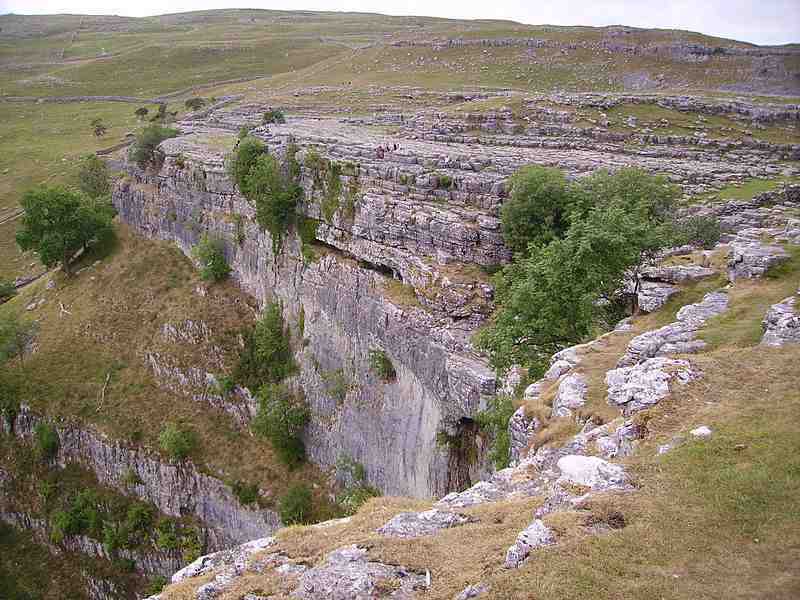 Thought to be about 50,000 years ago the cove was formed as above it a glacier melted forming a large waterfall, the remains of that stream are now flowing from Malham Tarn, near a point called ‘Water Sinks’ the stream flows underground. 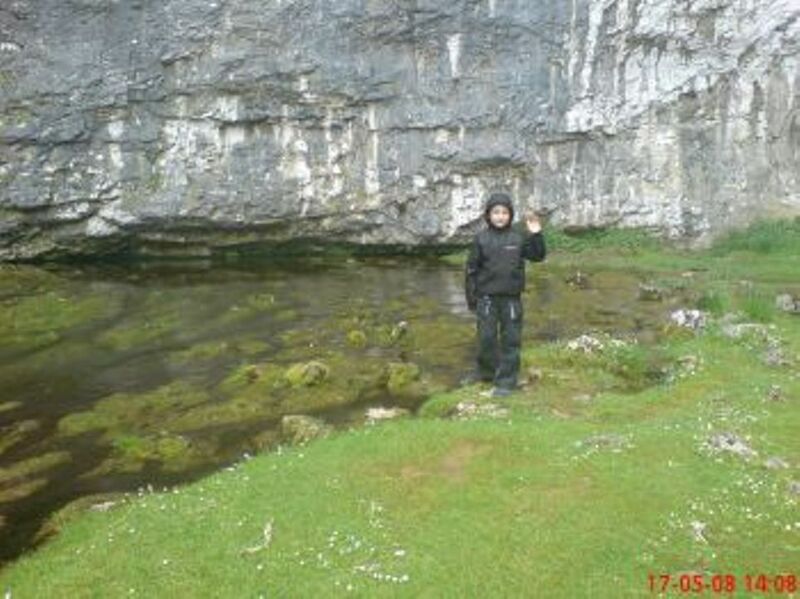 At the bottom of the cove, Malham Beck – a similar size stream – flows from a cave. For many years it was believed that these two streams were actually the same one. Recently dyes were used to show the path of each stream, at different points they go underground and reappear about one mile apart, all this without mixing paths behind the cove shows a system of complex caves. An entrance is at the base of the cove allowing divers to continue exploring, which so far amounts to over one mile of passages. 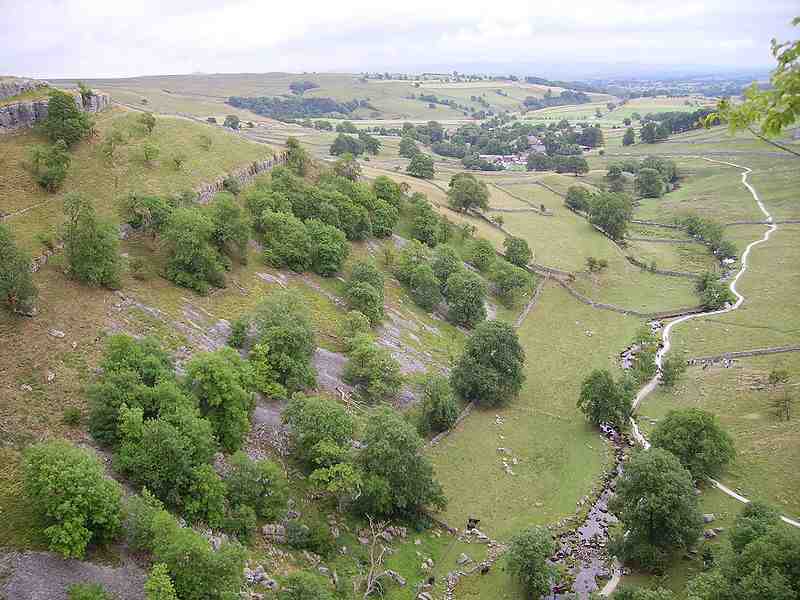 At 1,237ft (377m) the River Aire starts its life journey at Malham Tarn, after flowing underground it emerges near the cove for its 71mile (114km) journey to merging with the River Ouse, this takes in a total drop of 1,221ft (372m) to 16ft (5m) above sea level. Around 12,000 years ago the ground was frozen; with the climate starting to warm at the end of this last ice age the melting ice formed a huge river that had to flow over the frozen ground forming the Aire Valley, as the ground thawed it worked into the limestone leaving the delightful views of the limestone pave that can be seen today. When ever folks visit the cove and certainly if they decide to climb to the top then ensure decent adequate footwear is used, preferably ankle boots, these gaps in the limestone can quite easily result in broken ankles. The view from the top of the cove is spectacular, especially on a clear day. You can view the path we walked along to the base of the cove.